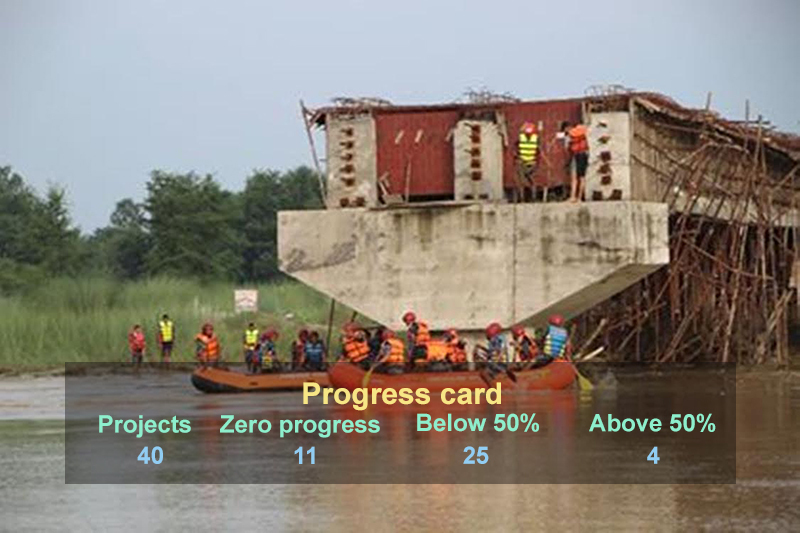 RAUTAHAT: Contractor Pappu Construction – tainted with corruption charges – is yet to finish building the bridge at Lal Bakaiya River – where five people died on August 25 after a boat ferrying 30 persons rammed into a pillar of the bridge – raising fears of another fateful incident among locals. The contractor had bagged the contract of a concrete bridge construction project for an amount of Rs 160.68 million with a deadline of July 15, 2017. However, the Road Division Office at Chandrapur says that Pappu construction has only finished 40 per cent of the construction works till date. On the other hand the locals are concerned as boats are the only means to cross the river in absence of a bridge and the state has failed to bat an eye on the issue putting more lives at risk. The locals of Gaur and surrounding regions, citing the lives the river has claimed, have expressed dissent over government’s inability to take action against the contractor for delays in completion of bridge construction project. On August 25, a boat ferrying around 30 passengers including women and children capsized mid-way as strong water currents in the flooded river rammed it into a pillar of an under construction bridge for which Pappu Construction had bagged the construction contract during erstwhile Prime Minister Late Sushil Koirala led government’s rule. Not only the Lal-Bakaiya bridge, Pappu construction has also been in controversy for poor construction performance in almost all of the projects it has undertaken. Following the boat capsize, the Commission for the Investigation of Abuse of Authority initiated an investigation and had filed graft case against former proprietor of Pappu Construction and Lawmaker Hari Narayan Prasad Sah Rauniyar, and his son, current proprietor of the company Sumit Rauniyar for using substandard materials in construction of Babai Bridge. In its case, the CIAA has accused Federal Socialist Forum Nepal lawmaker Rauniyar and his son of embezzling Rs 193.2 million. And despite a complaint at the district administration of Rautahat by kin of victims of the boat capsize seeking action against Pappu Construction, government has failed to do more than passing verbal reaffirmations that action will be taken.